The metabolism is comprised of all physical and chemical processes occurring in the body. Our body uses food as an energy fuel to be able to function normally, which is converted into energy by the numerous chemicals in the digestive tract. The pace of the metabolism is controlled by the nervous system and our hormones, and it slows down as we age. 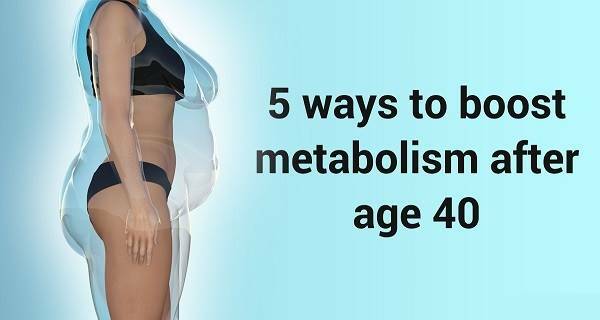 After 40, it is also much more difficult to drop the excess pounds and speed up the metabolism. You need to follow a healthy diet, rich in minerals, vitamins, and nutrients. Increase the intake of dairy, fruits and vegetables, and meat, and limit the consumption of processed foods, carbohydrates, alcohol and salt. To accelerate metabolism and detoxify the body, keep it hydrated and drink at least 8 glasses of water daily. To speed up the metabolism and help digestion, consume foods rich in fiber and protein every morning. Sleep reduces stress, burns fat, improves mood, and soothes the muscles. Opt for at least 10 hours of restful sleep every night. Try walking, swimming riding a bike, or running, to improve heart health and function, drop a few pounds, and relieve the postmenopausal syndrome manifestations.